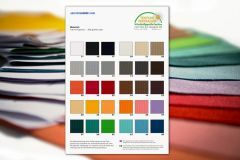 Find the perfect colour match for your project when it comes to choosing the right speaker cloth! This set of Acoustic Cloth sample swatches contains all 42 colours and provides an excellent first-hand impression of the speaker fabric and its vibrant colours. The sample swatches are approximately 4” x 6” in size, and the set of swatches is delivered free of shipping costs.